This is a sponsored post written by me on behalf of Miracle-Gro for IZEA. All opinions are 100% mine. Planting season is one of my favorite times of the year. I love the smell of fresh dirt and enjoy planting new items in the yard and garden. Some of you may not be as enamored with the process as I am, so I’m sharing my planting tips. I already shared a few easy gardening tips with you a couple weeks ago. A climbing hydrangea from our local nursery caught my eye and I immediately knew where it would live in my yard. Our neighbor keeps her garden pots and a few tools on the other side of the back of our fence. 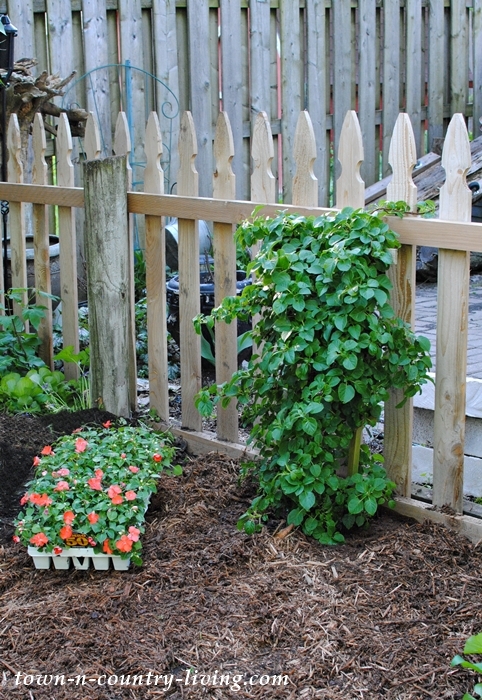 I decided to plant the climbing hydrangea along that side of the fence to hide her garden tools from view. My first planting tip is to choose the right location for your plant. Make sure the sun requirements are right. The hydrangea needs sun with a bit of shade, and this location is perfect since it will receive morning sun and afternoon shade. The second planting tip is to properly prepare the soil. Remove any existing weeds and lightly till the soil. I find it’s best to enhance the dirt with a concentrated planting mix. 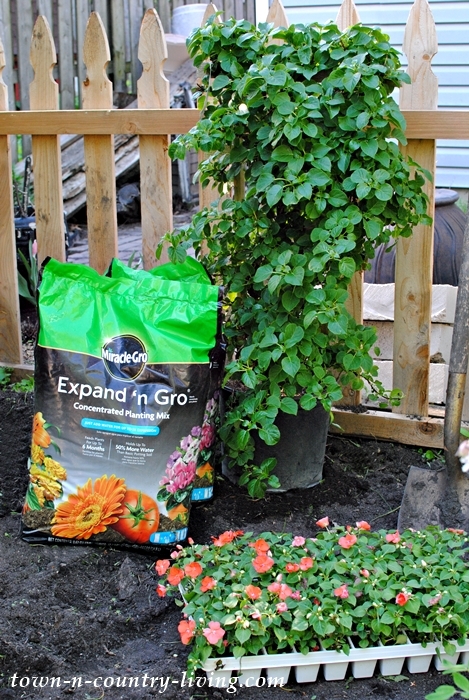 When soil is prepared with premium soil like Miracle-Gro Expand ‘n Gro, your plants will grow up to three times bigger than those grown in untreated soil since it feeds your plants for up to six months. 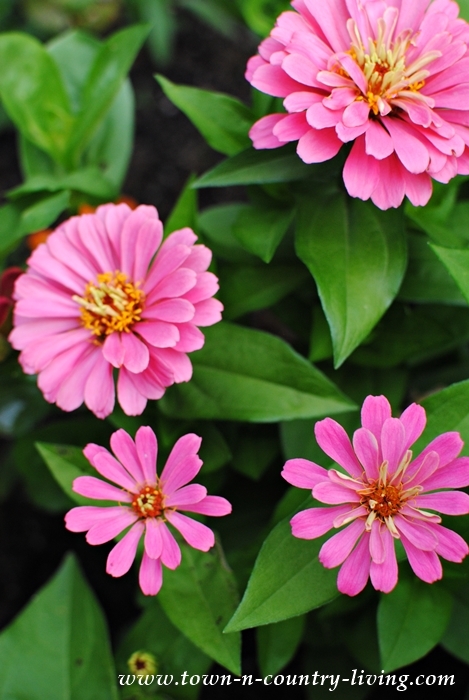 Spread a layer of it over the soil, about 1-inch deep. 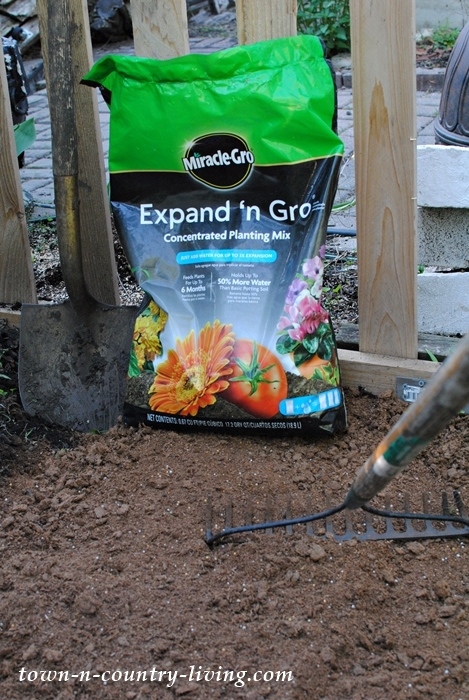 Next, work the Miracle-Gro Expand ‘n Gro into the soil, about 4 to 6 inches deep. Expand ‘n Gro adds up to 90% more air space to your native soil and its natural fibers hold up to 50% more water than basic potting soil. This is so important during dry, summer months. The third planting tip is to dig the right size hole for your plant. Dig a hole twice the size of your plant’s root ball. Once the hole is ready, take the plant out of its container and lightly loosen the roots. Carefully place your plant into the hole making sure you don’t bury the crown (the place where the roots meet the stems). 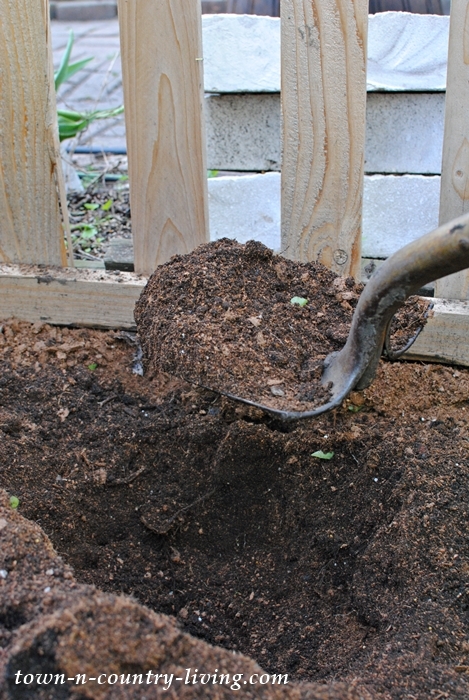 The fourth planting tip is to back-fill the rest of the hole with dirt and lightly tamp down to remove air pockets. The final planting tip is to mulch the soil around the plant. 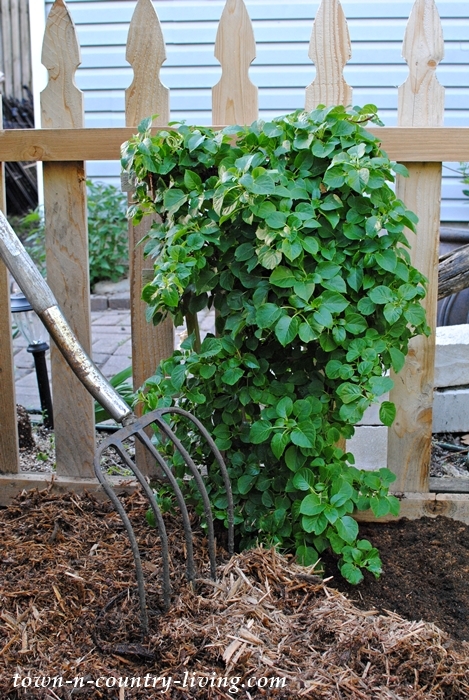 Apply about 1 to 2 inches of mulch to keep weeds from popping up and to help hold in moisture. 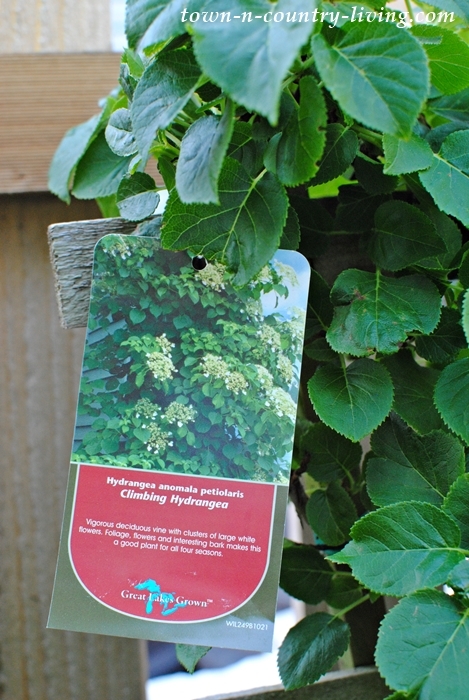 My Climbing Hydrangea is ready for the summer season! It grows about two feet tall but can spread several feet. Eventually it will climb along the fence and block the view of my neighbor’s garden work area. Not to mention, she’ll enjoy seeing the hydrangeas on this vine, too. My next garden project is planting my window boxes. This photo is from several years ago when the soil was still rich. 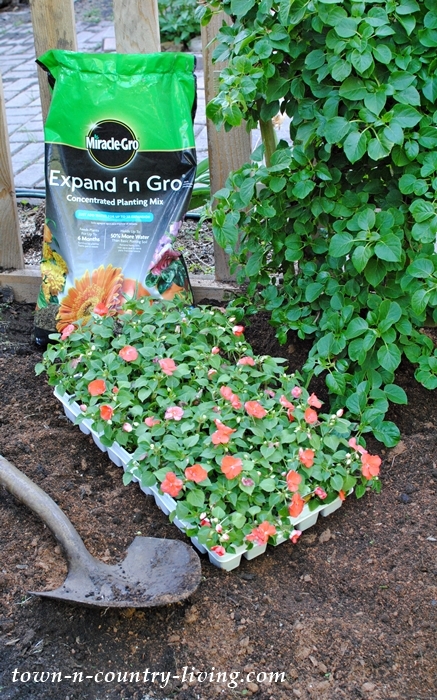 It’s a little depleted now so I need to enhance the dirt in the flower boxes and will use Miracle-Gro Expand ‘n Gro. I also need to prepare the beds of my cutting garden, too. Soon everything will be planted and it’ll be nice not to have to water as often. My zinnias are going to look even more amazing this year! 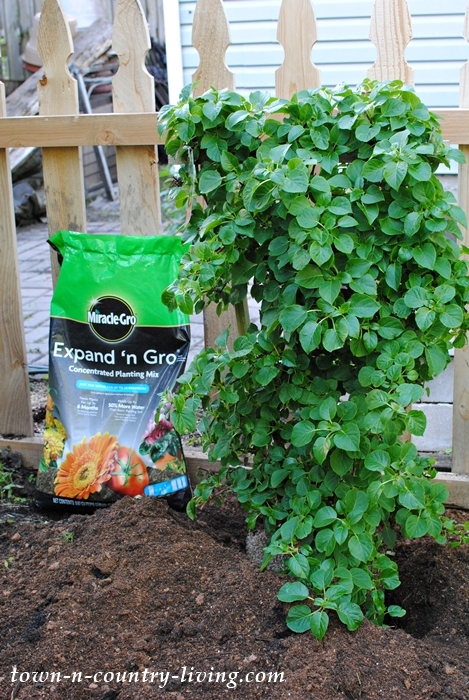 You can find Miracle-Gro Expand ‘n Gro on Amazon and have it delivered to your door. The bags are super light which makes them much easier to carry out to the garden. Not to mention it’s a time-saver since you can carry more than one bag at a time. What planting projects do you have lined up this season? Do you have any planting tips you’d like to share? a change from within Houses Jennifer ? have never seen a climbing hydrangea. That will be so pretty once it takes off and starts to bloom. Thanks for the gardening tips. I just looked up info on climbing hydrangea. Oh. my goodness it can get rather tall; can climb up to 60 feet and the way it looks; looks like it gets a rather large woody stem which will climb up trees. Climbing hydrangeas can nearly become trees if you ignore than. My daughter has one several years old started on a simple piece of 5 foot tall lattice and it has completely filled in a corner near her porch and is starting to wrap around one of her porch posts. However, she wanted it to hide an ugly and bare corner and it certainly does just that and more. She just keeps it controlled by trimming it back to where she wants it and it is beautiful. I’m sure it will do fine as a means to cover your fence and the unwelcome view and you will love it. My plantings, other than the herbs outside my back door, are late this year due to the timing of my vacation, so I’m just now getting started. My usual nemesis, the weeds and thistles must be addressed first. Yikes …. It is going to be so pretty.thanks for these tips and have a great day. I love the trellis and its going to be amazing when its all grown in. I’m not sure I’ve ever seen a climbing hydrangea! But I love hydrangeas so sure it will be gorgeous! 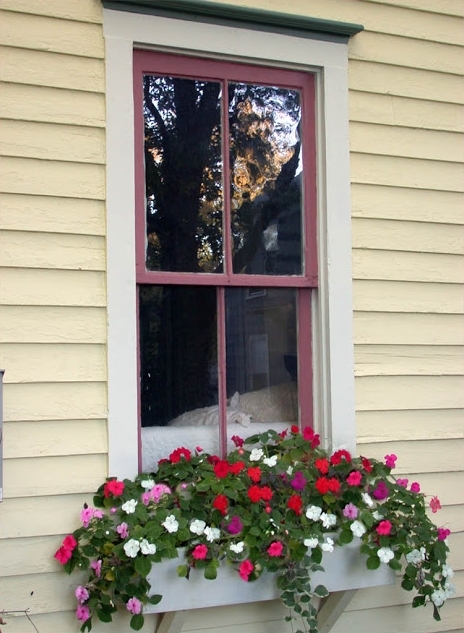 I love the windowbox! Your garden is stunning! The trellis is so beautiful. I’d love to have one too!